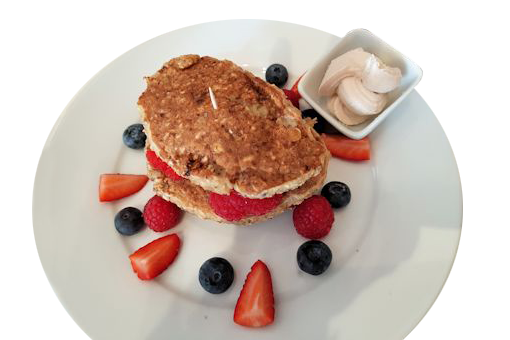 It’s great to discover eateries offering dairy and gluten free food on our doorstep in Surrey. We found The Healthy Cook Co www.healthycookcompany.co.uk in Old London Road, Kingston, when we visited the May Merrie event. It sells a wide array of mouth-watering dairy free and gluten free cakes – what a treat! It is run by Trisha Kelly whose Carrot and Raisin cake won the Best Free From Product in the Free From Awards www.freefromfoodawards.co.uk. Imagine our delight to indulge ourselves in cakes that are not only gluten free, but also dairy free. 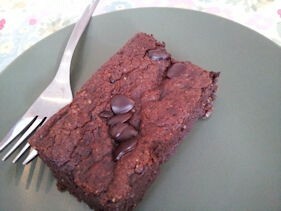 I chose a gluten free brownie (£1.50) while Ray opted for pear and almond tart, both of which were gluten free, dairy free, egg free, vegan (£2.30 a slice). He enjoyed it so much he ordered another slice! Celebratory ‘free from’ cakes are also available. Cakes are made using Trish’s own gluten free four mix – a blend of gluten free flours – brown rice flour (70%) potato flour and tapioca flour. Soya milk is also served. Open from 8.30am to 5pm Monday to Saturday. Needless to say we have been back and no doubt will be visiting again soon! Masses of publicity have surrounded Pizza Express’ introduction of gluten free pizzas, so we knew we must try it out. Long ago, before I became wheat intolerant, I used to love eating Pizza Express pizzas because of its light Italian-like pizza basses. We visited Pizza Express at Unit 5, The Rotunda, Kingston www.pizzaexpress.comwww.pizzaexpress.com. 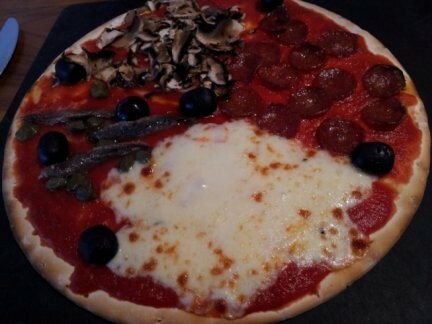 There’s a choice of pizzas – Romana (with a thinner crispier base) and Classic. I was told that all the pizzas could be made with gluten free bases except for Sloppy Giuseppe – ‘hot spiced beef’ which seemed odd. A strange alarm went off at this point, but the staff weren’t perturbed and it went off eventually. I chose the Veneziana with pine kernels, onions, capers, olives, sultanas, mozzareall and tomato with 25p going to the Veneziana Fund. Ray explained he had a problem with dairy, but also wanted a Veneziana. Please could he have prosciutto instead of mozzarella and very little tomato sauce. Our waiter said she would check and after a brief pause, returned to say it would be fine. My gluten free pizza was a bit biscuity but I could cut it. It was a pleasure to have a pizza – a Veneziana – which I haven’t eaten since my teenage years. The topping was delicious although the base was a bit hard to eat with slightly burnt edges, served on a grey board instead of a plate. At The Regent, a Chinese restaurant in Chessington, www.newregent.co.ukwww.newregent.co.uk, when Ray explained his dairy allergy, the waitress was very obliging checking with the kitchen several times that his choice of beef in satay sauce didn’t have dairy in it. She thought peanut butter would cause a problem, but he assured her it wouldn’t. Then she queried coconut milk, which he also said he could eat. So it was good to see them taking so much trouble to make sure he didn’t eat any dairy. I sing with Elmbridge Ladies Choir www.surreymusic.org and a group outing was arranged to visit The Clink restaurant in Sutton, Surrey www.theclinkcharity.com. This is part of HMP Highdown Prison, Sutton, where inmates have the chance to train in food preparation, food service and qualifications. Security was tight, mobile phones aren’t allowed, so I haven’t any pictures to show you. Once we had cleared security and had entered the restaurant, we lost all sense of being in a prison – it was just like being in a restaurant. The service was great, although a couple of waiters seems a bit nervous. Out of the 30 ladies, I was the only one who was gluten free. To start with I had a tomato soup (which was gluten free) without any bread and for my main course, I visited the extensive salad bar, one of the best I’ve seen because of the choice available. For dessert, the chef put together a special summer fruit medley for me which was delicious. We did sing for our lunch, giving them a our version of “Bahaha” an African folk song which was well received.